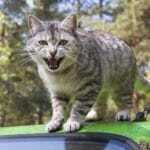 Is your cat acclimated to car travel? Why not prepare a cat travel kit? 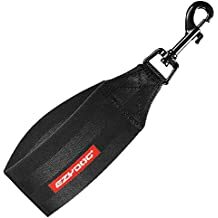 How to secure cat carriers in car? Can you leave your cat in the car for an hour? Is it illegal to leave your cat in the car? We often have to travel with our cats in car whether it is for going to the vet or to a trip. Car rides can be extremely traumatic for cats. Unlike dogs, cats are not comfortable to be outside their marked territory. That’s why a cat gets really nervous when she travels outside the home. 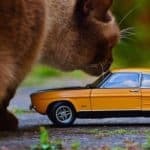 So, you need to know how to keep cats safe in cars when you are traveling with your feline friend. As I have said earlier, traveling tends to make cat nervous. So, they can associate your cat with something frightful and can get very scared when traveling in the car. Moreover, you need to take a whole lot of preparations if you are planning to go on a long road journey with your cat. To ensure that your cat doesn’t do anything dramatic out of fright, you need to take enough security measures to keep your cat safe in the car. In this article, I’ll share everything to you for learning how to keep cats safe in cars. It’s gonna be a long article. So, grab a cup of coffee, sit tight and enjoy the article. The first thing you need to do before anything is to buy a reliable cat carrier. most of the cat owners often forget the importance of a quality cat carrier. They usually go for a cheap one. Generally, the cheap ones don’t offer great quality and security. So, spend a bit more and get a decent cat carrier. you don’t have to spend a fortune on it. Read my article on best cat carriers to get a general idea. The carrier should be strong, durable yet lightweight. A heavy carrier is uncomfortable for both your cat and yourself. Many people often make the mistake of getting a cardboard carrier. personally, I think they are useless craps. Yes, they cost less than a plastic carrier, but the quality is not reliable at all. Also, they deteriorate within seconds if your cat has a little accident. Make sure the carrier is the right size for your cat. Your cat should be able to stand up and move around inside the carrier. but, don’t make it too large that she has to sit on a corner of the carrier. A good carrier has multiple entry systems such as front door loading, top loading etc. it will ensure that you can get your cat inside the carrier without causing much stress to the cat. It is also easier to check on the cat if the carrier has a top loading system. Ventilation is the most important aspect of a cat carrier. if you get this wrong, no matter how good the carrier is, it will be useless. Ventilation is what makes a carrier suitable for a cat. A good carrier should at least have 3 window mesh panels on sides for proper ventilation inside the carrier. A good ventilated carrier makes sure that your cat is receiving enough air inside. It also makes the carrier comfortable for your cat. Take a newspaper and fold it on the bottom of the carrier. it will ensure that if your cat has any accident, the paper will absorb everything. Then take a piece of towel and place it on the newspaper. 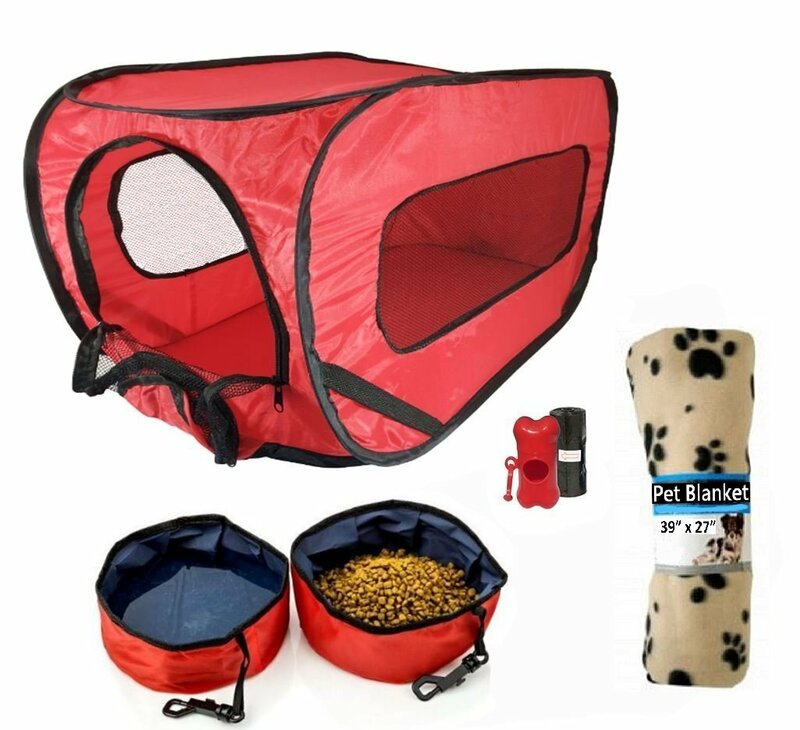 It will make the carrier comfortable for your cat. It is better if you can get a towel that your cat already sleeps on. The purpose of the towel is also to absorb any accident that your cat might have on the car ride. It also severs as a padding on the carrier. If you want to be extra careful, get a plastic liner and place it on the carrier. Double check nothing is blocking the ventilation holes around the carrier. Check the door lock. Make sure it is working properly and your cat can’t break it or escape. You can keep your cat’s favorite toys inside the carrier to make it more playful. If your cat is extra skittish, you might consider spraying some cat pheromone before the journey. The best place to secure the carrier in your car is the back seat. make sure the carrier is as much stable as possible. You can use suitcases or bags to make it more stable. A stable carrier ensures a soothing car ride. If there is nothing to place beside the carrier to make it stable, you can place it on the car floor. However, you have to make sure that the carrier is receiving enough air flow from the car windows. Always ensure the carrier is secured on the back seat before starting the car. It is better if you can strap a seatbelt around the carrier to make it more stable and secured. It will also ensure that the carrier doesn’t fly off if you need to make a hard break. Never ever let your cat out of the carrier once she is inside the car. It is a very bad idea to let your cat roam freely inside the car when you are outside on the road. She might get stuck under the seat, get on the gas pedal or even jump out of the window. After securing the carrier in the backseat, it is time to start the car. Try your best to make the journey risk free and comfortable for both you and your cat. Don’t do any unnecessary overtaking, drive at a regular speed and watch out for bumpy roads. Also, pay good attention to the traffic and your surroundings. Don’t get distracted by your cat unless she is calling out for help. Avoid hard breaks as much as possible during the ride. Also, try not to do any sudden turn. If you can, avoid bumpy roads. If there is a smoother alternative way, choose that one even if that costs more time. 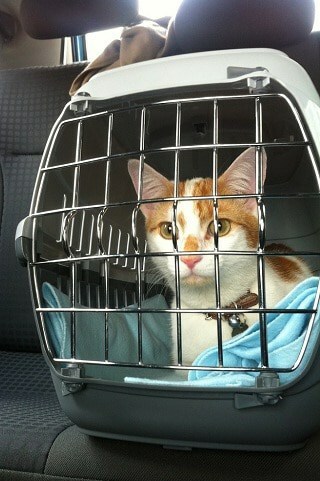 Sometimes, turning on the radio on a low volume helps to keep your cat calm in the carrier. If your cat is still nervous, talk with her. Assure her that everything will be alright. Say soothing whispers to her. Call out to her by her name. Your voice will lessen the stress of the cat to a large degree. Cats don’t do well in extreme weather. It doesn’t take much to make a cat overheat on a warm summer day. If the temperature is 26 degrees Celsius outside, the temperature inside the car can increase up to 38 degrees Celsius. It can make a cat very uncomfortable and sick. So, on a hot day, try to make the temperature inside the car as cool as possible. Leaving the windows open will surely help, but ensure that your cat can’t jump out of the open windows. If your car has an air conditioner, keep it running in the summer. Also, keep the heater on during cold winter days. Never leave your cat alone in a parked car. It is very unsafe for the cat. If you have a partner, take in turns to go to the restroom so that someone is always with the cat. Also, keep the air conditioner running. High humidity also plays an important role in overheating your cat. So, keep track of the temperature and the humidity of the place that you are going with your cat. If you need to park the car during the journey, always try to park it under a shade. Otherwise, the temperature may quickly rise up even with the air conditioner running on. Also, make sure that the carrier isn’t blocking the way of air passing through the car. If you need to park anywhere for a short break, park in a secured shaded place. if you don’t have a partner, kindly ask some security person to look after the cat while you are doing your business. If your destination place is extremely hot or alarmingly humid, then certain extra measures should be taken. Surely the air conditioner will help, but it won’t be enough. It is a good idea to get a cooling body mat for your cat in this situation. 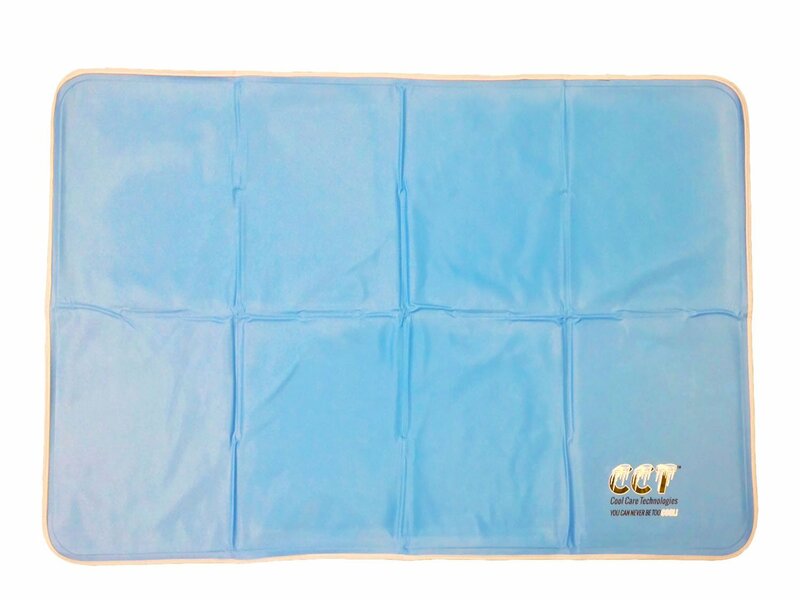 Cooling body mats have a refrigerated component inside the mat which can be water activated. A good quality cooling mat will remain cool for up to three days while remaining dry too! It is extremely helpful for a cooling a cat. You can look for cooling body mats in local pet shop. You can also get them from here. 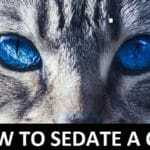 This step is extremely important yet many cat owners don’t put any emphasis on it. I have heard many stories of cats getting lost during travel and the owners couldn’t find them anymore. Do you know why? The cats didn’t have any ID tag. 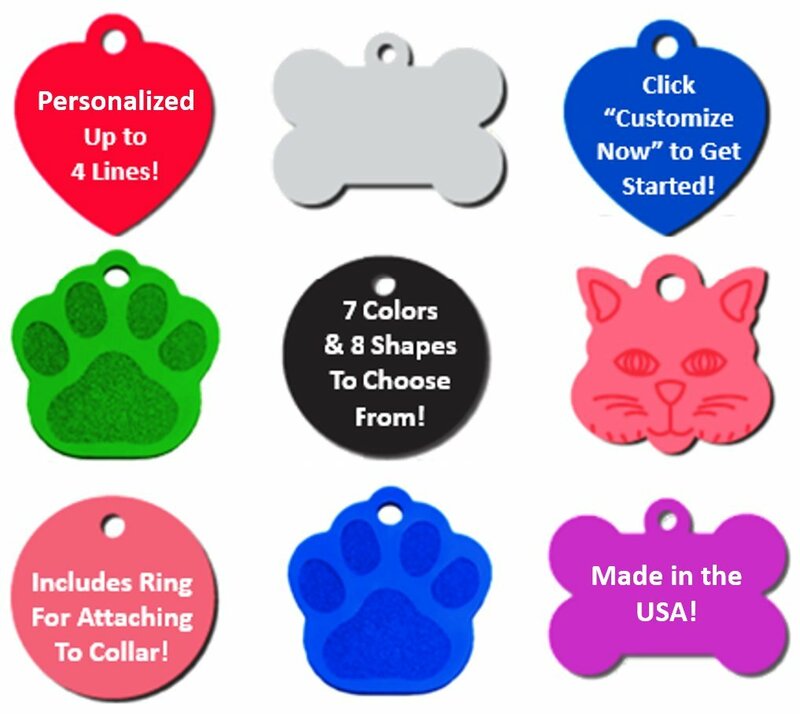 That’s why, before doing anything else, get a collar with ID tag for your cat. On the ID tag, write as much information as you can about yourself. So, if your cat gets lost by accident, someone can easily find her and give her back. The ID tag should contain at least your full name, mobile number and address. Don’t put a telephone number on the ID tag. It won’t help if you are going on a long journey. If it’s possible, get your cat microchipped. So, if she gets lost, a vet or an animal worker can easily identify her and return her to the owner. A microchip is far much more reliable than a collar. If your cat is traveling in the car for the first time, then there is a high possibility that she will get nervous and scared. At worst, she may even get sick. That’s why you need to acclimate your cat with car travel before going on a long journey. It is very important to make your cat used to with the car. At first, make your cat friendly towards the car. Sit in the car with your cat for some time. You don’t have to start the engine at this stage. Do this every day or at least every other day when you are free. 10 to 15 minutes’ session should be fine. It will make your cat adjusted to the car. The next step is to take your cat to short car rides around the block. Just ride for 10 to 15 minutes. It will make her used to with the engine sound, traffic sound, and overall outside environment. Do this every weekend when you have time. Lengthen the duration of these short drives gradually. When you can drive for 1 hour with your cat without any problem, she is fully acclimated to the car. It’s always smart to prepare for the worst. Even if you are going on a short distance journey with your cat, you don’t know what may happen on the road. Your car may stop running, the engine may malfunction or a thousand other unexpected problems may occur. You may even have to pass the night on the road. That’s why you always need to prepare a travel kit for your cat when hitting the road outside. This will ensure your cat has everything she needs even at the worst possible situation. As car travel can be pretty traumatic for cats, they might lose appetite. That’s why it is a good idea to lightly feed your cat before hitting the road. However, don’t overfeed your cat before a long journey. She may get sick and start to vomit. It is important to feed her lightly. Only give her half the amount of food that she would usually eat at dinner or breakfast. If your cat doesn’t become acclimated to car travel after applying every technique, possibilities are she’ll never get used to it. Sometimes cats with horrible past car experience will never get used to around car. In these situations, it is better to avoid car travel with your cat as much as possible. However, if you need to travel with your cat in the car, being secretive with the whole thing may help. Don’t let your cat understand that you are taking her on a trip. When carrying the carrier from home to the car, enclose it with a cloth so that your cat can’t see anything. In the car, set the cloth in such a way that your cat can only see what’s in front of her, nothing more. Choose a breathable cloth for this purpose. Try to avoid car travel if your cat is not okay with it at all. Always use a seatbelt to strap the carrier around the seat belt. It will make the carrier more stable and won’t fly off if you do a hard break. If you are unsure, put the carrier on the floor between the front seat and the backseat. This way, the carrier will have something to lean against. According to Ann E. Hohenhaus from Animal Medical Center in New York, cats can suffer from multiple injuries from car accidents such as ruptured lungs, broken bones as well as severe trauma. A recent study showed that unrestrained cats injure themselves more severely than restrained cats. Also, there are records of unrestrained cats jumping out of the window of a running car. So, if you can’t afford a decent carrier right now, get a pet vehicle restraint for your cat. If your cat’s seatbelt can’t secure the carrier properly, you can get an additional seatbelt specialized for securing cat carriers with a seat. These don’t cost a fortune and provide great safety for your cat. Click here for a good collection of cat carrier seatbelt. You can safely keep your cat in the backseat of your car using a car seat barrier. This item creates a barrier between the front and backseat so that your cat can’t make her way up to the front seat. it also acts as a protective barrier in case of an accident. Shop for car seat barriers here. If you are extremely serious about your cat’s safety while traveling, you should invest for a pet car seat. most cat owners love their cat like own child, and we do everything for the safety of our children, right? Snoozer’s locker car seat can ensure 100% safety of your cat during a car travel. 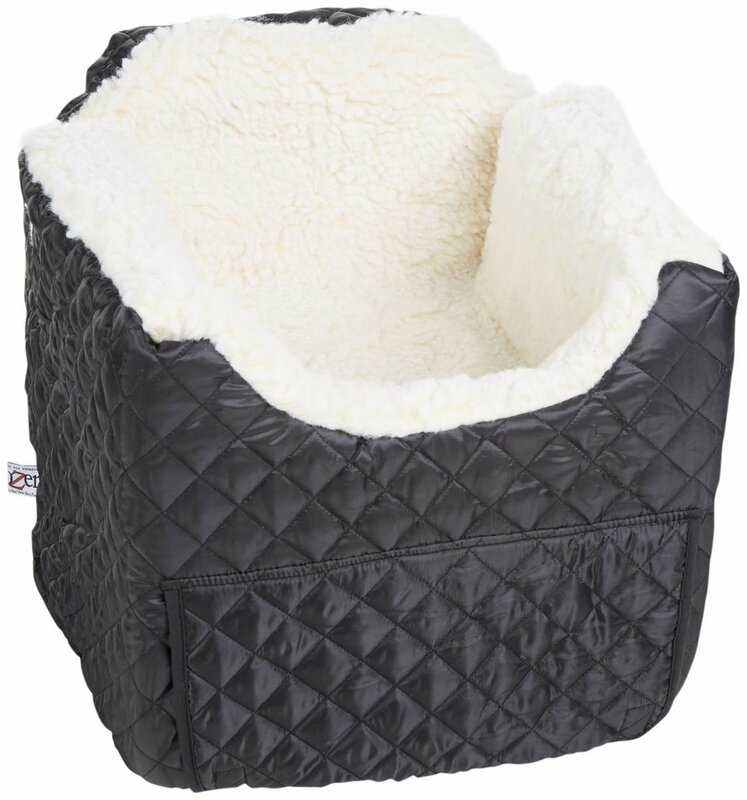 The seat is made from comfortable soft foam along with a sheep’s wool interior. Comes with connection straps so that you can join the seatbelt with the harness. Comes in multiple colors and two sizes. Click here to check out the latest price on Amazon. A good harness and leash make the car escape proof for your cat. It also allows your cat to move around freely inside the car within a short distance. You can attach the leash with the seatbelt of the car. So, your cat can’t escape even if the windows are open. Though it is a cheap item, it surely provides great safety for your beloved furry friend. Shop for cat harness and leash here. Contrary to popular belief, placing the cat carrier in the front seat of your car is riskier and dangerous for the cat. Mainly because of the airbag. According to the Center for pet safety, they recommend placing small cat carriers on the floor behind the passenger or driver seat. Unless you are absolutely sure about the structural integrity of the cat carrier, don’t place it on the back seat. Another way is to use a seat belt to properly secure the carrier with the backseat of your car. 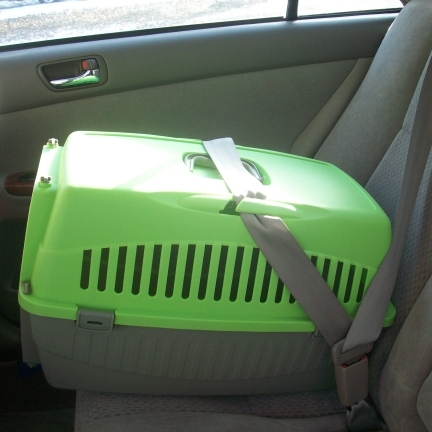 Buckling up a cat carrier is extremely important for the safety of your cat. It also saves your cat from fatal injury in case of an accident. In some states of the United States, laws have been assigned that pets need to be buckled up in a moving vehicle. In some cases, it can be the wall between life and death for your cat. I’ll highly advise against it. Leaving your cat unsupervised on an open road can be very unsafe. You don’t know what danger may come towards your cat. It is always necessary to keep a constant eye on your cat while traveling. If you need to stop the car and need some work to do, then ask your partner to look after the cat. If you don’t have any partner, then ask for a security person to look after the cat while you are doing your business. In a word, you shouldn’t keep your cat unsupervised for a single minute outside the home. It’s definitely not worth the risk. Many cat owners often ask this question. Well, I can’t give the answer in short. It really depends on which state you live in. The laws concerning pets in cold or hot vehicles have evolved dramatically in the past few years and different from state to state. Complete the work as quickly as possible and return to your cat immediately. If you don’t have any partner, ask someone trustable (like a security guard) to watch over your cat while you are away. Try to block as much sun ray as possible through the windshield. Keep the air conditioner running while you are away. It will ensure a comfortable temperature inside the car. Make sure your cat has access to pure drinking water. It’s a good idea to set an alarm for every 10 minutes while you are away from your cat. Whenever the alarm rings, hold off whatever you are doing and check on your cat. So, this is my guide on how to keep cats safe in cars. 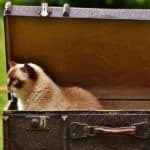 I hope the article has helped you by giving all the information you need to keep your feline friend safe while traveling. If you have any question, don’t hesitate to ask me in the comment box below. I’ll reply as soon as I can.